Yeeehaw! Did we mention that the boats have twin 250-horsepower motors? Hugging the shorelines! The captains are U.S. Coast Guard certified and have been doing this a long time. Zipping by the shore with all smiles on board! 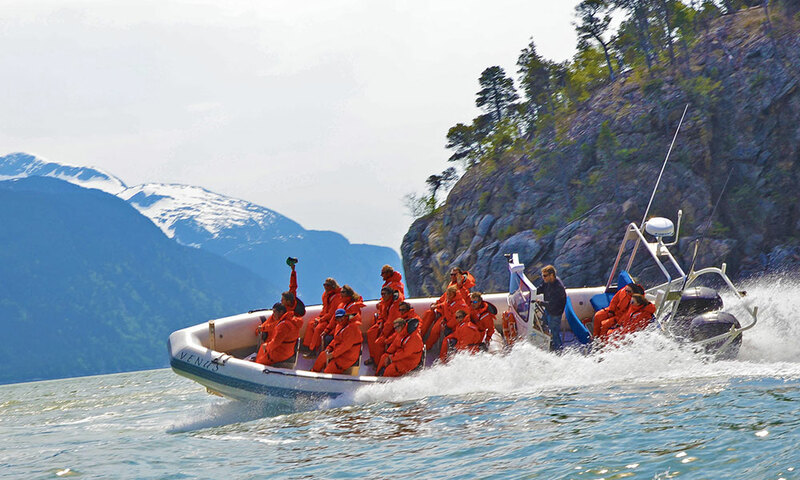 One of the newer tours in Skagway, the Ocean Raft Adventure combines speed, thrills, wildlife and just plain fun. Explore North America's longest and deepest fjord, the Taiya Inlet. This tour undoubtedly provides a different perspective of the Inside Passage than you'll see from the cruise deck, as you will be riding the same type of boat used by U.S. Navy Seals and Coast Guard rescue teams. With limited seating aboard, you'll zip through the inlet with your Coast Guard certified captain and guide exploring waterfalls, hidden coves, beaches and wildlife. The pictures tell the story better than we can! What makes this one of the best Skagway excursions? Everything! It's 2 hours jammed with adventure, as this isn't your ordinary wildlife cruise. Powered by twin 250-horsepower motors, this vessel is designed to comfortably operate in any sea condition. Starting the tour with a pick-up at your cruise ship, you'll get a brief safety orientation as well as outfitted with all the necessary gear you need: an exposure suit to keep you warm and dry, Oakley goggles and balaclavas. Departing right from the boat harbor in Skagway, the tour of the Taiya Inlet exposes eagles, sea lions, and quite often even whales. Captains provide a colorful narrative and share their extensive knowledge of the area, while finding hidden waterfalls and beaches not seen from the cruise decks. You can sit back and enjoy the ride on custom shock-absorbing seats, and definitely don't forget your camera because you'll be up close and personal with wildlife on this one. What's great is that this is one of the Skagway excursions that originates and culminates right in town, so it leaves you with plenty of other time to explore the town, enjoy another tour or explore lots of other interesting things to do in Skagway. Thrill Seeker? Consider the Rainforest Canopy & Ziplining Expedition in Ketchikan, & the Mendenhall Glacier Trek in Juneau! Minimum Age: Children must be 10 years or older to participate on this tour. Accessibility: Must weigh less than 350 lbs. Due to the high activity level of the tour we do not allow pregnant women or people with neck or back injuries. What to Wear: Dress warmly and wear comfortable footwear on this tour. You will provided with an exposure suit to keep you dry and warm, Oakley goggles, and balaclavas. Don't forget your camera! Q:What type of boat is it? This is the only US Coast Guard certified open Zodiac tour in Alaska. Our custom-built, 30-ft. RHIB (Rigid-Hulled Inflatable Boat) is designed to safely operate in virtually any sea conditions. With its deep-V aluminum hull surrounded by an inflatable collar, this Zodiac Hurricane 920 is able to provide a comfortable ride for up to 17 people. This is the same type of vessel used by the Navy Seals and US Coast Guard teams on extreme missions worldwide. We are powered by twin 250-horsepower, four-stroke outboard motors to make us the fastest ocean tour in Alaska! Q:Where does this tour go? This tour explores the Lynn Canal, which is the longest, deepest fjord in North America and one of the largest in the world, measuring at over 2,000 feet deep. Although it is named a canal, it is actually a fjord, which is a glacially carved U-shaped valley. The Taiya Inlet was an important waterway during the Klondike gold rush, offering passage to the deep-water port of Skagway and, by smaller boat (due to sediment from the Taiya river), the now ghost town of Dyea. These 2 boom towns were gateways to the White Pass and Chilkoot trails. Great staff. Wonderful excursion. Learnt a lot about area. Our group of 13 had a wonderful time on the Skagway Ocean Raft Adventure! Our ages ranged from 17 to 73, and everyone enjoyed seeing the mountains and waterfalls up close. All the gear we needed was provided - suits to keep us warm and dry, gloves, hats, and goggles. The word "raft" is misleading - our driver (wish I could remember his name!) made sure that we went fast at times, and the young adults in our group loved that! Our guide Alyssa was great, and we all learned so much about the plants, trees, and wildlife. We were thrilled to see some otters and eagles. This was a very fun way to enjoy Skagway. Ocean Raft Adventure - Wow! This adventure exceeded our expectations! The boat captain was skilled, and gave us thrills. We enjoyed the lovely scenery--getting up close to the waterfalls and observing many bald eagles in their natural habitat. Everyone in our group agreed we would definitely do this again! A thrilling exhilarating ride which we really enjoyed, this is a unique experience & I encourage anyone who is visiting Skagway to take the ride.